The Central Tibetan Administration (CTA) finally defended its decision to publicize its own list of Shugden protesters in an official press release. It fallaciously pointed out that the names and pictures of the protesters were already in the public domain. The claim is both an affront to logic as well as an outright lie. Firstly, there had been no list of vocal Shugden followers available online with accompanying pictures. Secondly, it is evident that the CTA went to a great deal of trouble to capture the protesters on camera and identify them one by one. What the CTA did here was an attempt to “out” Tibetans who actively voice their protest against the ban on the worship of Dorje Shugden by the Dalai Lama and the CTA. It is also interesting that the list was exclusively made up of Tibetans while, clearly, there were also non-Tibetans who participated in the protests. If anything, the attempt by the CTA to shame the Tibetan protesters only confirms that the discrimination against Shugden followers it vehemently denies actually exists. The list, so detailed in its indictments, might as well be an official list of pariahs within the Tibetan Diaspora. The “security concerns” that the CTA cited as one of the underlying reasons for publishing the list are, at best, unfounded. The protests against the Dalai Lama throughout his American and European tours so far have never been marred by any act of violence. Admittedly, they have been persistent, vocal but peaceful. Even more ridiculous is the effort to resurrect the old specter that Shugden devotees are “a group with a history of violence e.g. murder, physical assault and arson.” The 1996 murders of Lobsang Gyatso, Ngawang Lodoe and Lobsang Ngawang seem to have provided the CTA with sufficient ammunition with which to label all Shugden followers as potential murderers. It has conveniently chosen to forget that investigations by the authorities into the case have never conclusively proved who was responsible. Perversely, the only nebulous piece of evidence alleged by the CTA to pin the crime on Shugden followers was a letter. It was proclaimed that the letter contained a death threat against Lobsang Gyatso by the Dorje Shugden Society in New Delhi. Subsequently, however, the letter was translated and no death threat emerged from it. What is also interesting in the CTA’s statement is its fondness for the term Dolgyal whenever referring to Dorje Shugden. The Tibetan epithet means the Spirit King of Dol. Dol evokes the name of the place where the remains of Tulku Drakpa Gyaltsen were scattered after his murder by the attendants of the Fifth Dalai Lama. CTA’s chosen designation for Dorje Shugden is in fact very demeaning. Within the term Dolgyal is enshrined the Dalai Lama’s claim that Shugden is neither a Buddha nor a Dharmapala. Rather, according to the current Dalai Lama, Shugden is a spirit, the wrathful and restless spirit of Tulku Drakpa Gyaltsen. 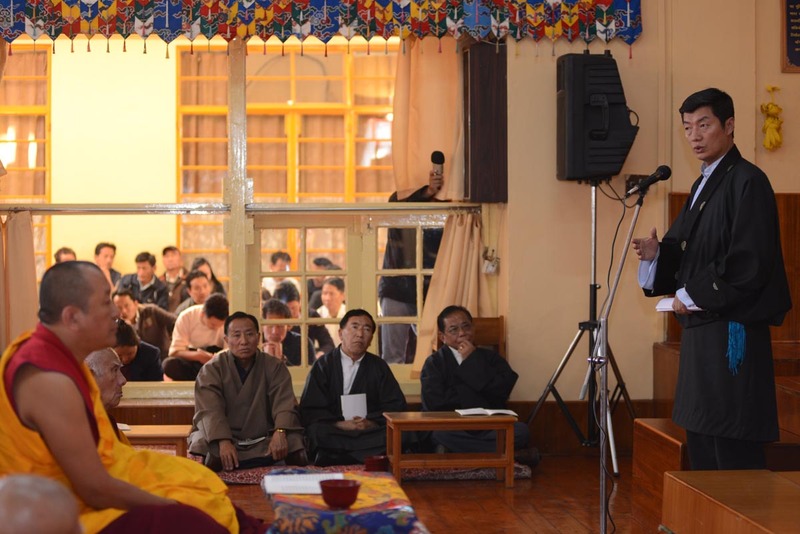 Lobsang Sangay expresses solidarity with Tibetans who have self-immolated for the cause of Tibet, and those who continue to suffer under the Chinese rule; choosing to ignore the inequity Shugden practitioners suffer under their governance. If the CTA is not in favor of discrimination against Shugden followers, as it claims, its choice of name for Dorje Shugden is indeed bewildering. As an institution that seeks to represent all Tibetans, it should use a neutral term to describe a deity that is worshipped by a portion of the Tibetan population throughout the world. It should certainly refrain from employing an epithet that is pejorative in the view of Shugden followers. Muslims, for example, used to be called Mohammedans by many in the English-speaking world. But many Muslims objected to this name, arguing that it is both inaccurate and insulting. Over time, out of deference to the Islamic world, the name went out of use. The world now calls the adherents as Muslims, as they like to be known. Judging by this notion alone, it is clear that there is a great lack of good will within the CTA towards Shugden followers. If it indeed respected freedom of speech, as it often declares, then it should never have embarked on a shaming game by publishing its outrageous list of “Dolgyal protesters”. To add insult to injury, it has also chosen a most derogatory name for Dorje Shugden in all its official documents. To top it all, the CTA has also, without concrete evidence, concluded that Shugden followers were a tool for the Chinese government, simply because they dare to question the Dalai Lama. Again, out of convenience, it has branded anyone who refuses to toe the line as Chinese agents. By refusing to acknowledge the discrimination that is taking place against Shugden followers, the CTA has failed the Tibetan community in exile miserably. Instead of discouraging discrimination, it accuses the Shugden community of paranoia and persecution mania. But perhaps the paranoia is the CTA’s alone, so much so that it has deemed it necessary to create imaginary adversaries in Dorje Shugden and his followers’ involvement in a conspiracy orchestrated by Beijing. The CTA’s defence of the Shugden Protestors Hit List, published on their official website. The only time anyone’s mugshot is put on a list is when they are required to be present for interrogation, punishment and some kind of persecution. CTA’s actions and antics shows no respect to anyone or anything and this is the situation which they have fostered with the Dorje Shugden issue. Splitting the Tibetan people will not create any waves towards Tibetan independence. The CTA is creating more causes for themselves to fail. The entire tireless work and policy of Banning Shugden worshippers directly or indirectly by DLama and CTA is for the long run becomes soon or later with the new present Chinese policy useless. The energy,time and money spent on restriction of this God/ Spirit etc by Anti-Shugden group will all be wasted and above all the so called Great Unity among Tibetans and different religious lineage and Buddhist Centres are irreparably damaged. China has been for the few years gradually tolerating and indirectly promoting Shugden worshippers in Tibetan speaking regions and among the Chineses. Why is China doing this? China is doing this because Dharamsala is banning and increasing its pressure more and more against those worshippers. On the part of Dharamsala, the Banning itself is a strong contradiction to the begging for Dialogue with China and constantly blaming China for supporting financially all Shugden people. Now lets say that Middle Path Policy becomes accepted by China somewhere soon down the road. What would be then at that very moment of history on this famous BAN ? Will China allow then DLama and CTA to carry on with the Ban ? I doubt it because China has been and will be striving for Great Social Stability and therefore doesn`t permit any anti-social activities. So once DLama goes back to Tibet soon then the whole Shugden issue is gone for ever under the Central Chinese Governemnt. THEREFORE ALL ANTI-SHUGDEN ACTIVITIES BY DHARAMSALA WILL BECOME AT THE END A ” BIG JOKE ” IN THE HISTORY. Now there is another option or perhaps who knows about the Hidden Agenda of DLama and CTA , that they are actually fighting for Tibet Independence all the way from 1959 and still is their sole agenda behind the Middle Path Policy. If this is the case,then banning Shugden is not at all WASTE. I think that their press release is a joke. It is evident that the CTA is covering up their ulterior motives of publishing the “hit-list” of Tibetans who protested against the unjust ban enforced by His Holiness and the government in exile. Protests occur all the time. If CTA published that list to inform other Tibetans with no access to materials online who protested, why don’t the CTA also publish a list of people who protests for Free Tibet, since they are unsung heroes to the Tibetan cause? They should be mentioned too. All governments should in fact do a list of people who protest for they all in one way or another, calls for action and creates change – but why has no other government done that thus far? Because it just isn’t right, and the government isn’t out to get its own people, but to listen to what they need and see if they can accommodate to their wishes. Its funny the way CTA operates and thinks. And to generalise and label that all Dorje Shugden practitioners have a history of violence is insulting. The 5th Dalai Lamas attendants were the ones who killed Tulku Dragpa Gyeltsen. Does that mean that all of the Dalai Lama’s attendants are also violent and all have the intention to murder? Of course not! So by saying what they did on the press release, they are inciting and basing their accounts on false accusations with no basis, evidence or proof. I agree with Eli that CTA has no respect and they are so arrogant and do things without any reasoning. They just have to tell the Tibetans that HH Dalai Lama said so, and Tibetans will just blindly follow. In the past, CTA will just arrogantly ignore the objections, but from what I see now, they are actually spending their time to defend it. What does that mean? I seriously wonder if CTA is losing financial support from the west that they need to clarify? Their accusations and ways of handling this is seriously unethical and a joke! But what irks me the most is the list of names and pictures that they put on their site to show people. Are they for real? How irresponsible and lame! And they say we, the practitioners are the violent ones? What make them any less ‘violent’ by posting those information on the web and waiting for their loyal fans to make a move and then when something happens, they say its not their fault coz they didn’t ask anyone to and blame others for their childish act. CTA, please show some maturity in how you handle things. Such a big ‘administration’ and you can’t come up with something less insulting for your group? Please don’t insult those with intelligence. I am really amazed with what the CTA has written on their website. It totally makes no sense at all. They are just openly boycotting those that do Dorje Shugden practices. There are many evidence that shows that many places do not allow Shugden practitioners to be entering into Tibetan places or even be able to buy things. They have openly accused the practitioners that are daring enough to speak up to what they believe and do what they want to do. They are not doing anything that is violent of harming anyone, they are just doing peaceful protest that I do not see any wrong in. Everyone have their freedom of speech. With that, the protestants can be saying whatever that they would like to be saying during protests. Why should they be bounded by what they can do and cannot do? As each and every single individual, we are able to follow what we want. We should never be discriminated about our believes or what we want to do as long as we are not harming others when we carry out our actions. If the CTA feels threatened by these Tibetan pro Shugden people, they should openly have a discussion or dialogue with them to clear out the differences. After all pro or anti Shugdens and the CTA are all countrymen. They are all Tibetans. In fact CTA as public servants to its people should be more humble and proactive in solving the people’s problems. Listing them out on their websites etc makes it look like such an old fashioned approach. Reminds me of the time when the cowboys put up “wanted” signs with the criminal faces and paste them all over town. In this time and age listing them out will not solve the problem but instead will invite more problems. In my opinion, the reasons listed in the letter above doesn’t justify the act at all.